Censor reports from the UK have revealed the main plot of ‘Thalapathy’ Vijay’s Mersal. 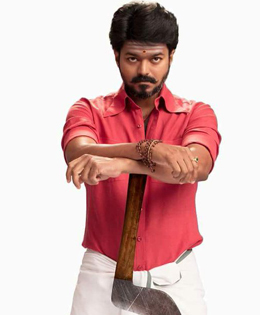 “Mersal is a Tamil language action thriller in which a magician and a doctor attempt to expose the corruption at the heart of India’s medical industry”, this is the summary mentioned by BBFC. As everyone guessed, the father Vijay somehow murdered by the deadly villain SJ Suryah, who involves in a medical scam and how the two sons take revenge against their dad’s death is the story of Mersal. Nithya Menon is the pair for dad Vijay, Samantha is the pair for doctor Vijay and Kajal is the romantic interest of the magician. Meanwhile, The Madras High Court, on 12 October, directed the Registry to place before the Chief Justice a petition which has alleged that theatre owners were collecting excessive charges and sought an interim stay on release of Vijay-starrer Mersal till the plea was disposed of. The petitioner, G Devarajan of Perambur, submitted that every time during release of a new film, theatre owners collect excessive charges above the rates fixed by government. "A higher rate is being charged for the first five days. Thereafter the rates are reduced but still above the prescribed rate ...," the petitioner submitted. So it is still a question if Mersal will be released on date passing all the hurdles.